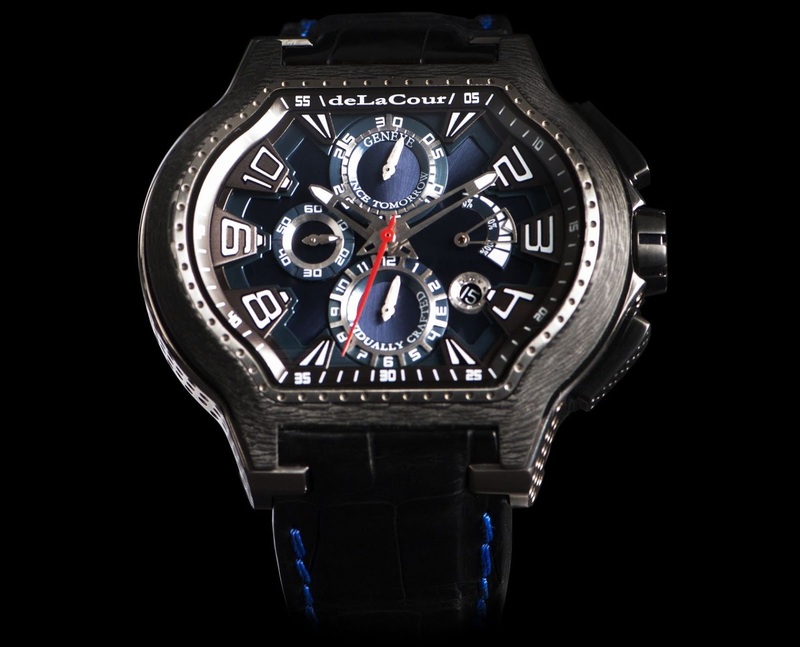 Swiss luxury watch brand deLaCour, presents a special limited edition of 88 pieces with the City Episode S Bleu. 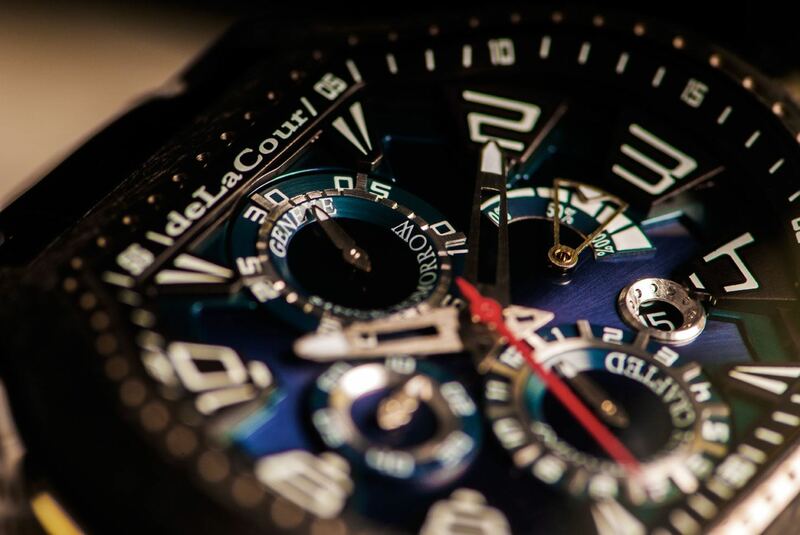 Sporty and elegant, this exclusive model is dressed in a deep blue color. 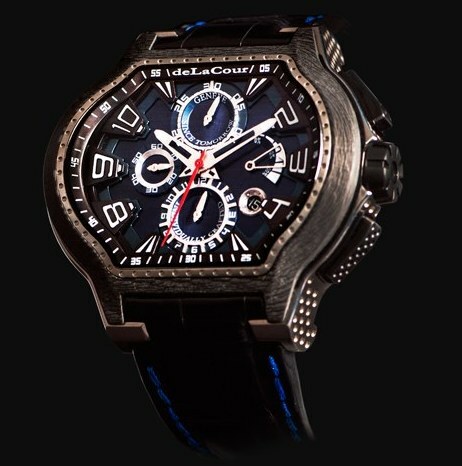 This model is a sporty version of the deLaCour City line. The elliptical shaped case features all the trademarks of the collection: a strafed flange and bezel, as well as the folded horns. This sporty, yet very elegant watch is available in a titanium version featuring a carbon bezel. The counters are perfectly positioned in the center of the dial and display high-precision chronograph information: at 6 o’clock the hours counter, at 9 o’clock the hours and minutes counter, at 12 o’clock the aggregated chrono minutes, at 3 o’clock the power reserve indicator and the date is displayed in a window situated at 4 o’clock. The red seconds-hand stands out to insure great readability of the seconds as they tick away during timing. The openwork and luminescent tips seamlessly integrate the dial. But the exceptional feature of the City Episode S Bleu and its particular magnetism, mainly resides in the color of its dial: a stunning blue. Made of galvanized metal, embellished with a sunray finish, it catches the eye and doesn’t let go. It reflects light elegantly when the light effortlessly dances on its surface. The dial is delightfully round and the curves deeply highlighted give the impression that its circumference disappears into the case. Offering great readability day and night, the dial of this automatic winding, elegant watch, is characterized by sobriety: a simple and clear minutes display punctuated by double flanged numerals pushed towards the center, the first enabling seconds, the other the hours. The various indicators of the chronograph, like the numerals situated on the flange are treated with Superluminova. This timepiece is waterproof to 5 ATM and is presented on a hand-stitched crocodile or rubber strap, which offers comfort and elegance.